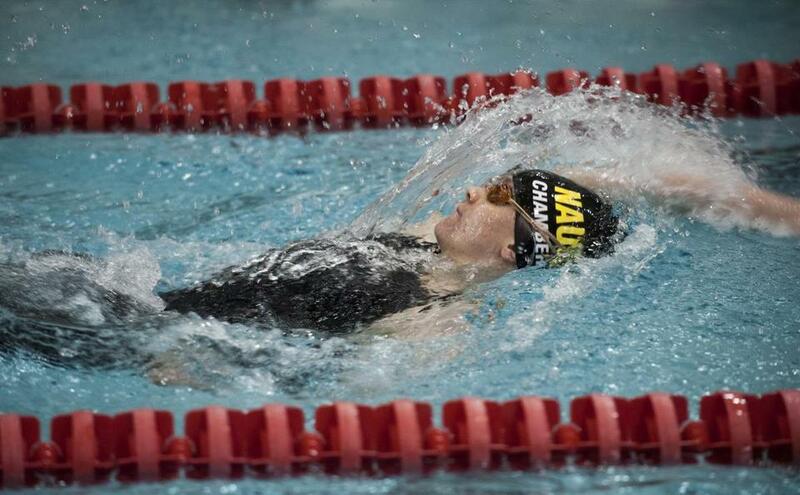 Nauset’s Marie Chamberlain wins the 100 back at the Division 2 state championship, the second straight year she’s won that event. Chamberlain also won the 100 butterfly. Making her second straight All-Scholastic appearance, she took things to another level, capturing the 100 backstroke state title for the second straight year (56.09). She also set the state record in the 100 butterfly (54.66). She set six new records at Nauset this year. Marrkand dominated the pool this year for Westford, earning two state state titles in the 200 IM (2:00.22) and the 100 back (55.20), which were both meet rcords and All-American times. She also earned an All-American time in the 100 fly at the DCL meet. With no sectional meet Bryson had to settle for simply being the best in the 50 free in the most competitive league in the state, the Dual County League. She also was second in the 50 at the Division 2 state meet and third in the 100 free. Hargrave captured two Division 1 state titles this year and helped lead the Red Rocketeers to a sixt-place finish at states. The Hockomock League MVP, she won the 200 free in a time of 1:53.66, and followed that up with a 500 free victory in 5:02.51. Making her fourth appearance here, Huber helped lead the Grey Ghosts to the Division 1 state title. Individually she earned her third straight 100 breaststroke title (1:06.70). She is an honor student and a four-year member of the soccer team. Jameson showed the depth of the Dual County League once again, capturing 200 free Division 2 state title in 1:52.36. She is the DCL record holder in the 200 and 500 free, and owns seven individual records at Bedford. An honor student, she will attend Yale. Even though her brother Sean graduated, Meghan made sure a diving state title stayed in the family, earning her second straight state title, scoring a 505. A DCL All-Star, she is an honor roll student and a member of USA Diving. O’Shea was the top EMass swimmer in the 100 and 50 free, finishing second in both events at the Division 1 meet. She was DCL champ in the 100, second in the 50, and anchored the state champion 200 relay team. O’Shea is an honors student. Pierce helped lead Wayland to an undefeated year while capturing the DCL and Divsion 2 state titles. She owns the highest number of points scored in school history and owns five varsity records. A high honors student, she will attend Williams. The EIL Swimmer of the Year qualified for five events for the US Jr. Nationals. Reis also set the all-time New England Prep School time in the 100 fly. Reis also plays varsity lacrosse, and swims for the Seacoast Swimming Association. Only a sophomore, Swensen made a name for herself earning top honors in the 100 butterfly at the Division 1 state meet (56.72) after winning the same event at the Northeastern Conference meet. She was also NEC champ in the 200 IM. Thompson earned the Division 2 state diving championship this year turning in a score of 516. She is a two-time Dual County League All-Star and also a vasity member of the soccer and lacrosse teams. She also competes for USA Diving. This talented quartet cruised to the Division 2 state title in the 200 free and helping lead Wayland to an undefeated season, and a second straight Division 2 state title. They were also DCL champs in this event. As sophomores, Downs and Molly Pierce are the youngsters of the group. Both have been DCL All-Stars in their first two years of varsity swimming. Pierce earned individual All-Scholastic honors this season. Wright was the lone junior on the squad and swam the anchor leg in 24.95 to ward off all comers and clinch the title. A big part of Westford’s state title this year was its dominance in the relays, and the tone was set in the first event of the day when this quartet blitzed the field by five seconds to cruise to a win in 1:48.36. Marrkand swam the opening leg in 26.59 getting the group out to a two-second lead, followed by fellow individual All-Scholastic Huber who swam her leg fastest in 30.49. Weinstock went third and maintained the lead. Gosselin swam the fastest anchor leg split in 24.52 to easily clinch the top spot. This group blitzed the field at the Division 1 state meet this year, capturing the top spot in 3:35.63, almost five seconds ahead of second place. The efforts helped lift Westford to its second straight Division 1 state team championship. Gosselin qualified for states in a pair of events as a freshman and swam the anchor leg. Martin earned DCL All-Star honors in a number of events and finished third in the 100 fly at states. Marrkand picked up All-America honors in three events this season. Weinstock was DCL champion in the 100 back and fifth at states. After winning six All-Scholastic honors as an athlete, Klick now earns her second straight Coach of the year Award as she led Westford to an undefeated Dual Meet season, a DCL title and its second straight Division 1 state title. McCully lead Nauset to an undefeated dual meet season with a 9-0 record, and a Bay Colony League championship. Nauset also won the Cape Cod Classic, the Bay Colony League meet and earned sixth at the Division 2 state meet. Bay Colony — Barnstable: Rachel Bulter, Caroline Ells, Meghan Mamlock. Bridgewater-Raynham: Erica Johnson. Coyle & Cassidy: Kendra Cerce. Nantucket: Sophie Davies, Alexa Dragon, Dakota Dragon, Cara Garufi, Alex Shannon, Audrey Snell, Eliza Steadman, Frances Steadman. Nauset: Marie Chamberlain, Molly Drake, Annie Harris, Julie Hayoun, Whitney Knowlton-Wardle, Shylee Stewart, Hannah Walsh. Sacred Heart: Reilly Robbins. Taunton: Mackenzie Heather. Dual County — Bedford: Brooke Jameson, Olivia Jameson. Concord-Carlisle: Rachel Andre, Meghan O’Brien, Cassidy Smith. Lincoln-Sudbury: Ansley Baker, Emma Jarcyzk, Catherine MacKeen, Leah McCabe, Katherine O’Shea, Alicia Perry, Clara Shealy, Kim Yang. Newton South: Anna Garik. Wayland: Kristina Barakov, Lori Cliff, Amy Cunningham, Anna Downs, Madison Kiefer, MIndy Lou, Megan Pierce, Molly Pierce, Heather Wright. Westford: Emma Gosselin, Grace Gosselin, Kelly Huber, Jack Koravos, Jen Marrkand, Courteney Martin, Jayne Pilachowski, Tori Weinstock. Weston: Tori Acuna, Caroline Bryson, Victoria Bryson, Mikaela Thompson. Hockomock — Attleboro: Sarah Nordberg. Canton: Tiffany Ha, Shannon McLaughlin. Foxborough: Maddie Fletcher. King Philip: Elise Lambalot, Cara McCarthy, Emily McQuaid, Sydney Nasson, Carly Schnabel. Mansfield: Marissa Gabrilowitz, Maeve McGowan, Emily Weiner. North Attleborough: Aidan Devers, Sarah Hargrave, Julia Hausmann, Julia St. Pierre. Oliver Ames: Jacquey Gover, Haley Gula, Julia Mudd. Sharon: Liza Krause. Tri-Valley — Holliston: Nina Sparre. Hopkinton: Carly Adams, Bridgette Coffey, Brianna Gallo, Emily Lewkowicz, Renee Salois, Abbey Will, Ashley Windhauser. Medfield: Jen Alban, Meridith Bertoni, Natascha Borgstein, Haley Dolan. Norton: Madison Thorr.